Flash includes controls (Eye, Lock, and Outline icons) in the layers section of the Timeline that allow you to quickly hide, show, lock, or unlock layers and layer folders, and display objects on a layer as colored outlines. Using colored outlines makes it easier to distinguish in which layer an object appears. When you hide a layer or folder with the Eye icon, a red X appears next to the name. When you lock a layer or folder with the Lock icon, a padlock appears next to the name. When you display layers as colored outlines with the Outline icon, a frame appears next to the name. When you change a folder, the controls affect all layers within a folder. 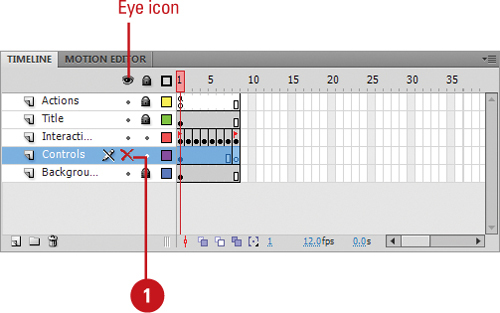 Click the Eye column to the right of the layer or folder to show or hide it. Click the Eye icon to show or hide all layers or folders. Option+click (Mac) or Alt+click (Win) in the Eye column to the right of a layer or folder to show or hide all other layers or folders. 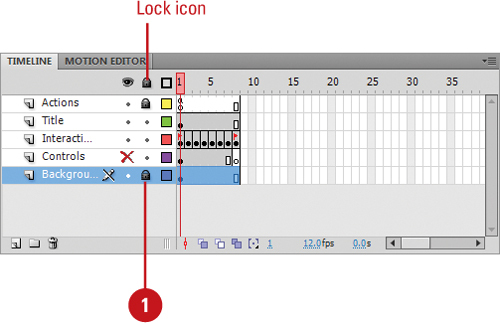 Click in the Lock column to the right of the layer or folder to lock or unlock it. Click the Lock icon to lock or unlock all layers or folders. Option+click (Mac) or Alt+click (Win) in the Lock column to the right of a layer or folder to lock or unlock all other layers or folders. 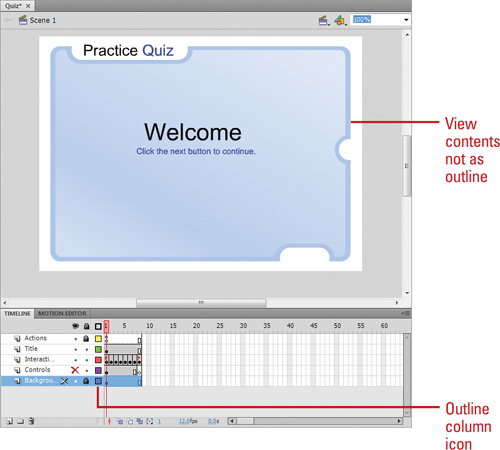 Click the Outline column to the right of the layer’s name to display its objects as outlines. 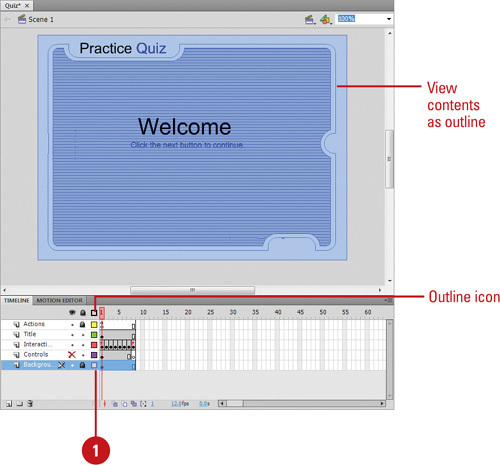 Click the Outline icon to display objects on all layers as outlines. Option+click (Mac) or Alt+click (Win) in the Outline column to the right of a layer to display objects on all other layers as outlines. Hidden layers are visible when you publish a document. When you publish a Flash document as a SWF movie, hidden layers are visible in the Flash movie file.